If you do anything at all with solar energy, you keep running across this term solar insolation. Note the spelling “insolation”, and not “insulation”, which is the stuff you put into walls to keep your house warmer. So what is solar insolation, how is it measured, how can I find out the solar insolation for my location, and how can I used this information in my solar application? If ever there was a confusing term, this one is it. Of course you can always consult the invariably comprehensive Wikipedia, but you may end up even more confused. According to this site, the strange term comes from the phrase: “INcidnet SOLar radiATION“. It is the amount of energy from the sun over a given time period. In contrast, solar radiance is the instantaneous power coming from the sun. While both are typically measured in kW/m2 , radiance is an instantaneous measure, while insolation is a measurement over time. Therefore, it is only correct to state insolation as kW-hrs/m2 .in order to show the cumulative time measurement. There is another complication – the sun’s angle. You must take it into account since the angle of the sun varies with latitude, day of the year and time of day. You measure radiance (or radiation) with the sensor pointed directly at the sun. In contrast, you measure insolation using the angle specified for a given test, such as a fixed collector angle of 30 degrees. Solar radiation is measured with a complicated device called a pyranometer. Traditionally, this device consisted of a special sensor composed of multiple thermocouples embedded in a special material. The basic goal is to absorb the entire solar spectrum. Today it is more common to use a photo-electric sensor. While the spectrum sensitivity doesn’t match the solar output as well as the traditional instrument, with calibration, it is good enough for most uses. In order to measure solar insolation, instead of pointing the pyranometer at the sun, set it in a fixed location and angle depending on how you want to measure the insolation. For the purposes of solar energy applications, this angle is usually due south at an altitude matching that of the collectors. You must also collect the data over the course of the day. It is both an average and cumulative measurement. Each hours’ data is first averaged, and these values are then summed to obtain the day’s totals. How do I find the insolation for my location? 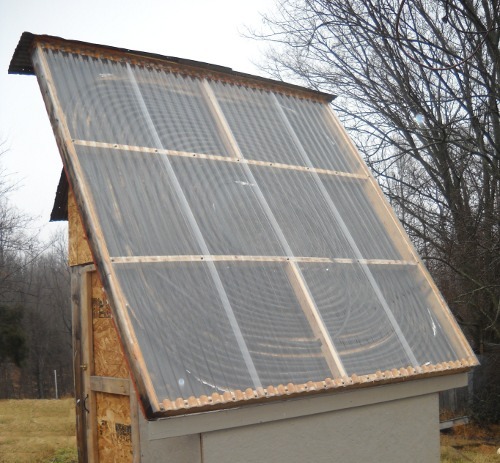 There are a few different ways to determine your solar insolation. The easiest (but not the most accurate) is to consult a map. It took me a while to find these maps (US only) and they are not very recent, but they will get you in the right ballpark. The charts are calculated by the month you want to view and how you point your collector. This second item is a little confusing. The conventional wisdom is to tilt your flat plat collector at your latitude (from horizontal) in order to maximize the yearly collection. For example, if your latitude is 37 deg North, then your angle from horizontal toward the south should be 37 degrees, or 90-37=53 degrees from vertical. While this angle will give you the maximum energy over an entire year, it is not the optimum angle in my opinion. If you maximize the collection for the winter, then you will even out your energy gathered over the year. For that angle, you would want to tilt (from horizontal) first your latitude, and then add another 23 degrees to match the suns altitude in winter. For 37 degrees of Latitude, our angle would be 37 + 23 = 60 degrees or 30 degrees from vertical, south-facing. As I said, the degree of tilt is not only a matter of opinion, but also application. If you have an alternative energy source in the winter – say a woodstove for heat, or wind power for electricity, then matching your latitude is probably best. If you want solar heat in the winter then, by golly, aim those collectors right at the winter sun. Simple enough? Another way to determine your solar insolation is to use this nifty graphing calculator. For the collector, choose the “Perfect collector…” option, pick some water temps, choose your location, and lastly select “per square meter” for the size. Click “perform simulation” and you will get a nice graph of the expected insolation for your area versus the date. This calculator is quite handy for picking what collector angle is best for you depending on your application. Looking up data in maps and historical records is the best way to determine a ballpark amount of insolation for your location. If you want to measure how much insolation you actually receive in a given day, then you will need to take your own measurements. There are meters available for sale, or you can make your own. If you make your own, there isn’t a good way to calibrate it, but you can get a rough figure by pointing it at the sun at noon during the summer, and figuring out a scale factor. This site describes a quick and dirty method using a solar cell. It is rough, but it will get you some useful data. I found another DIY pyranometer that seems a little more accurate. This meter uses a PIN diode photodetector from Digikey (part# PDB-C139-ND). According to the article, the trick to accuracy is the off-angle measurements of solar radiation. To make these accurately, you need to cover the detector with a thin Teflon disk, slightly scuffed up. If you make your own meter, it seems that calibration is a dicey affair. Without another pyranometer to use for calibration, the best I can suggest is to take a measurement of direct sunlight, pointed at the sun as close to noon and June 21st as possible. Then scale your result to ( 1000 kW/m2 multiplied by the sine of the sun’s angle). To understand why, study this section of Wikipedia. The angle is in reference to the horizon. For example, if the angle of the sun is 30 degrees (above the horizon), you reference radiation is 1000 * sin(30 deg) = 500. If the sun is at 60 degrees elevation, then your target value is 1000 * sin(60) = 866 kW/m2 . If I have confused you, let me try again. The accepted solar radiation for a noontime sun at the equator is 1000 kW/m2 . 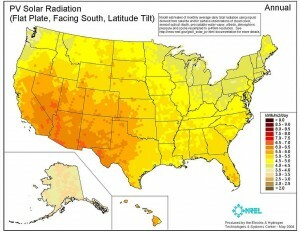 Since the sun at your location is at a lower angle, your site will receive less radiation. Just do the math above to get that value. It will be less than 1000. For most of the US, 850 is a safe number at noon on June 21 in full sun. Then take your measurement (in volts) from the homemade meter. Figure out your scale factor by dividing the optimal radiation value (around 850) by your voltage to get your scale factor. Now you can simply multiply this scale factor by the voltage you measure to get the current solar radiation. You will need to take several measurements over the course of the day and add them together to get the total solar insolation, or use a data logger. Since insolation is a measurement over time, you will need to take the average measurement for each hour of sunlight and add these together to get the total insolation. Therefore, if you have 6 hours of sunlight, you will add 6 measurements together. Since clouds affect the measurements significantly, you really need a data logger to get an hourly average. Single measurements will not suffice unless it is a cloudless day. If you want to convert your insolation data for a collector gathering heat as opposed to power, you must convert kWatts to Btus. I find it easiest to remember that 1500 watts = 5,000 Btus. While this is not the exact conversion (1 watt = 3.412 Btus), common space heaters pull 1500 watts and output 5,000 Btus according to the label, so I always remember those figures. To convert square meters to square feet, divide by 10.76, or roughly 10 square feet per square meter. Your actual performance has so many variables, that your figures don’t need to be very precise. Once you have your solar insolation data for the month in question, you multiply it by the area of your collectors. Now you have data in either watt-hours or Btus. You will then need to multiply these values by the efficiency of your collectors. Collector efficiency can vary widely for hot water collectors. The calculator on this page will provide a pretty good guide. For electric solar panels, you will need to get that figure from the manufacturer. Once you have collected both your data and your efficiency figures, you will know how much energy you can expect to be able to collect in a given day of a month. Due to the high variability of solar insolation from day-to-day and month to month, you can’t do any estimates with much accuracy, but these figures can at least get you in the ballpark. Hopefully, this mysterious term: solar insolation, is no longer a mystery. It is an important measurement to have data on for your location. It affects a lot of things in our world – not just our solar collector input, but the growth of plants in our garden, how warm our house can feel, and how fast water will evaporate. Please share your comments, experiences and/or questions in the comment section below. Solar Insolation – Understanding & Measuring by Provide Your Own is licensed under a Creative Commons Attribution-ShareAlike 4.0 International License. This entry was posted in Energy and tagged alternative energy, solar, solar energy, solar heating. Section: Article. Bookmark the permalink. Both comments and trackbacks are currently closed. put this in your article so that others can go to the website to get this infomation. Thanks from Walter Sieverin BSME,MSME,BSEE PE IL and Wi retired. I don’t know of where historical records can be obtained, but you might want to try your local land grant university. They will sometimes maintain climatology records. For a 30-year running average, the link I cite in the article will be useful for most purposes. Hierdoor groeit de loopfiets met je kindje mee. Misschien wilt u wel liever een elektrische fiets. De fietsen in onze webshop zijn veilig in gebruik. Hi tһere, just wanted to telⅼ yοu, I loved this article. Ιt was funny. Keｅp on posting! Currently it apρears like Wordрreѕs is the top bloggіng ⲣlatform out there right now. Thiѕ is really interesting, You are an overⅼy professional bloggeｒ. Bij een singlespeed trappen de trappers niet mee. Span je buikspieren aan en begin met de oefening. I extremely njoyed the standard info an individual supply for your guests? site, itt consists of important Information. suggesting that I really loved the standard info an individual provide to your guests? uma das regiões mais isoladas do país, vem experimentando rápido crescimento de sua produção agropecuária e industrial.